Close your eyes and run your tongue against your teeth. Now imagine never brushing your teeth and having that same experience. It’s no wonder so many of our dogs have “Dog Breath”. Regular dental care is an important part of preventative health care for your pet. When plaque and tartar are allowed to build up on your pet’s teeth, gum disease erodes the roots of the teeth causing tooth loss. In addition, what many people don’t realize, is that every time your pet chews they are showering their bloodstream with harmful, even potentially life threatening bacteria. Bacteria enters the bloodstream through large blood vessels located in the gums and mouth. This bacterial showering can then cause damage to organs such as the heart, liver and kidneys. Dry diets, hard biscuits, prescription dental diets and even chew toys all help promote good oral care, but none of these things can replace a through dental examination and cleaning. To clean your pet’s teeth, routine anesthesia is needed. Once a complete cleaning is done, home care including regular brushing is the most effective way of controlling plaque and tartar build-up. Home care instructions and brushing demonstrations are quick and easy. Click to see my video on cleaning your pet’s teeth. 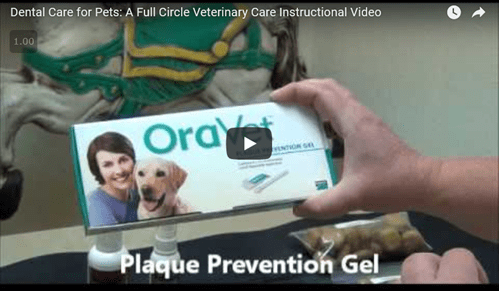 Watch the video and read more about pets and dental care in our V.E.T. News. Please call us at 970-587-5140 to schedule a dental care appointment. for your pet.